John Joseph Patrick Ryan (December 30, 1920 – January 21, 1998), best known by his stage name, Jack Lord, was an American television, film and Broadway actor, director and producer. He was known for his starring role as Steve McGarrett in the CBS television program Hawaii Five-O, which ran from 1968 to 1980. As a child, Lord developed his equestrian skills on his mother's fruit farm in the Hudson River Valley. He started spending summers at sea, and from the decks of cargo ships painted and sketched the landscapes he encountered—Africa, the Mediterranean and China. He was educated at St. Benedict Joseph Labre School, John Adams High School, in Ozone Park, Queens, and the United States Merchant Marine Academy, then located at Fort Trumbull in New London, Connecticut, graduating as an Ensign with a Third Mates License. He attended New York University (NYU) on a football scholarship, and earned a degree in Fine Arts. He spent the first year of the United States' involvement in World War II with the United States Army Corps of Engineers, building bridges in Persia. He returned to the Merchant Marine  as an Able Seaman before enrolling in the deck officer course at Fort Trumbull. While making maritime training films, he took to the idea of acting. Lord received theatrical training from Sanford Meisner at the Neighborhood Playhouse. He worked first as a car salesman for Horgan Ford, then later as a Cadillac salesman in New York to fund his studies. Later he studied at the Actors Studio. His Broadway debut was as Slim Murphy in Horton Foote's The Traveling Lady with Kim Stanley. The show ran for 30 performances, October 27, 1954 through November 20, 1954. Lord won the Theatre World Award for his performance. Lord was then cast as Brick in a replacement for Ben Gazzara in the 1955–1956 production of Cat on a Hot Tin Roof. He had been in The Little Hut (his first play), The Illegitimist, and The Savage. His first commercial film role was in the 1949 film The Red Menace a.k.a. Project X, an anti-Communist production. He was associate producer in his 1950 film Cry Murder. In 1957, Lord starred in Williamsburg: the Story of a Patriot, which has run daily at Colonial Williamsburg since then. In 1958, Lord co-starred as Buck Walden in God's Little Acre, the film adaptation of Erskine Caldwell's 1933 novel. Lord was the first actor to play the character Felix Leiter in the James Bond film series, introduced in the first Bond film, Dr. No. According to screenwriter Richard Maibaum, Lord demanded co-star billing, a bigger role and more money to reprise the role in Goldfinger, which resulted in director Guy Hamilton casting Cec Linder in the role. In 1962, Lord starred as series namesake Stoney Burke, a rodeo cowboy from Mission Ridge, South Dakota. The basis for the series was real-life champion rodeo rider Casey Tibbs. The series featured Warren Oates and Bruce Dern in recurring supporting roles. Lord credited Gary Cooper as his on-screen role model, and the inspiration for his characterization of Stoney Burke. Lord was considered for Eliot Ness in The Untouchables before Robert Stack won the role. He did appear in the Season One episode "The Jake Lingle Killing." In 1965 he guest-starred as Colonel 'Pres' Gallagher in second-season episode 5, "Big Brother" of 12 O-Clock High. Other television guest appearances include Appointment with Adventure, The Americans, Bonanza, The High Chaparral, Combat!, The Man from U.N.C.L.E., The Reporter starring Harry Guardino, The Fugitive, The Invaders, Rawhide, Ironside, and The F.B.I. Lord appeared on the first episode of Have Gun, Will Travel. In 1968, Lord appeared with Susan Strasberg in the film The Name of the Game Is Kill. According to William Shatner, in 1966, Gene Roddenberry offered Lord the role of Captain James T. Kirk on Star Trek, to replace Jeffrey Hunter, whose wife was making too many demands. Lord asked for 50 percent ownership of the show, so Roddenberry offered the role to Shatner. 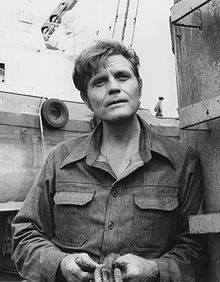 Jack Lord helped conceive Hawaii Five-O and starred for its 12 seasons as Detective Stephen McGarrett, appointed by the Governor to head the (fictional) State Police criminal investigation department in Honolulu, Hawaii. The opening sequence includes a shot of Lord standing on a penthouse balcony of the Ilikai hotel. Chin Ho Kelly, the name of the police detective played by Kam Fong, was a tip-of-the-hat to Ilikai developer Chinn Ho. Lord's catchphrase, "Book 'em, Danno! ", became a part of pop culture. He was instrumental in the casting of native Hawaiians, instead of mainland actors. Lord insisted his character drive Ford vehicles; McGarrett drove a 1967 Mercury Park Lane in the pilot, a 1968 Park Lane from 1968–1974, and a 1974 Mercury Marquis for the remainder of the series (this very car was shown in the 2010 remake). Lord was a perfectionist. At the airing of its last episode, Hawaii Five-O was the longest-running cop show in television history. When series creator Leonard Freeman died in 1974, the show's ownership was shared among Lord, CBS and Freeman's estate, with a contract that made Lord executive producer and gave him complete control over content. He was a hands-on partner who paid attention to minute details, and was known for battles with network executives. During his years at NYU, Lord and his brother Bill opened the Village Academy of Arts. Jack's childhood dream was to become an artist. His first professional sale was in 1941 to the Metropolitan Museum of Art for his two linoleum cuts, entitled Vermont and Fishing Shacks, Block Island. Lord's first marriage to Anne Willard ended in divorce in 1947. Lord met his son (from his first marriage) only once when the boy was an infant. The boy was later killed in an accident at age 13. Lord met his second wife while house hunting in upstate New York. On January 17, 1949, Lord married Marie de Narde, who gave up her career in fashion design to devote her life to him. Marie designed Lord's off-camera wardrobe, as well as her own. Cinematographers sometimes refer to a 50mm lens ("5-0") as a "Jack Lord" in reference to the name of the show that made him famous. In the Scottish Comedy series Still Game , one of the characters has a recurring nightmare where he sees the spirit of Lord rising from a coffin. The programme aired three years after Lord’s death, with another character asking if Lord is dead, Only for the other to say he doesn’t know. After his series ended in 1980, Lord kept a low profile, rarely making public appearances. His final TV appearance was that same year in a failed pilot for a new CBS series called M Station: Hawaii which he also directed. Lord suffered from Alzheimer's disease for at least seven years before his death, though some accounts have suggested that he may have had the illness as early as the twelfth season of Hawaii Five-O. He died of congestive heart failure at his home in Honolulu, on January 21, 1998, at age 77, leaving an estate of $40 million. He was a philanthropist and the entire estate went to Hawaiian charities upon his wife Marie's death at age 100 in 2005. A bronze bust of Lord by Hawaii sculptor Lynn Weiler Liverton was unveiled in a ceremony at the Kahala Mall outside Macy's on June 19, 2004. The Lords lived in a condominium in the Kahala area, and they were known to frequent the neighborhood mall. The nonprofit Jack Lord Memorial Fund, which raised the money for the memorial, was co-chaired by British Hawaii Five-O fan Esperanza Isaac and Lord's co-star Doug Mossman. Man Against Crime "The Chinese Dolls"
The Elgin Hour Lieutenant Davis "Combat Medics"
The Philco Television Playhouse "This Land Is Mine"
Westinghouse Studio One Paul Chester "An Incident of Love"
Westinghouse Studio One Matt "A Day Before Battle"
Climax! Charlie Mullaney "Mr. Runyon of Broadway"
Have Gun – Will Travel Dave Enderby "Three Bells to Perdido"
Playhouse 90 Jim Kester "Lone Woman"
Playhouse 90 Homer Aswell "Reunion"
U.S. Marshal Matt Bonner "Sentenced to Death"
The Millionaire Lee Randolph "The Lee Randolph Story"
Rawhide Blake "Incident of the Calico Gun"
The Loretta Young Show Joe "Marriage Crisis"
The Untouchables Bill Hagen "The Jake Lingle Killing"
The Lineup Army Armitage "The Strange Return of Army Armitage"
Alcoa Presents: One Step Beyond Dan Gardner "Father Image"
Bonanza Clay Renton "The Outcast"
Naked City Cary Glennon "The Human Trap"
Route 66 Gabe Johnson "Play It Glissando"
The Americans Charlie Goodwin "Half Moon Road"
Outlaws Jim Houston "The Bell"
Stagecoach West Russ Doty "House of Violence"
Stagecoach West Johnny Kane "The Butcher"
Rawhide Paul Evans "Incident of His Brother's Keeper"
Cain's Hundred Wilt Farrell "Dead Load"
Checkmate Ernie Chapin "The Star System"
Dr. Kildare Dr. Frank Michaels "A Willing Suspension of Disbelief"
The Greatest Show on Earth Wally Walker "Man in a Hole"
The Reporter Nick Castle "How Much for a Prince?" Wagon Train Lee Barton "The Echo Pass Story"
Kraft Suspense Theatre Paul Campbell "The Long Ravine"
The Loner Reverend Mr. Booker "The Vespers"
Combat! Barney McKlosky "The Linesman"
Bob Hope Presents the Chrysler Theatre Abe Perez "The Crime"
Twelve O'Clock High Lt. Col. Preston Gallagher "Big Brother"
Laredo Jab Harlan "Above the Law"
Twelve O'Clock High Col. Yates "Face of a Shadow"
The F.B.I. Frank Andreas Shroeder "Collison Course"
The Virginian Roy Dallman "High Stakes"
Bob Hope Presents the Chrysler Theatre Don Owens "The Faceless Man"
Bob Hope Presents the Chrysler Theatre Harry Marcus "Storm Crossing"
The Invaders George Vikor "Vikor"
The Fugitive Alan Bartlett "Goodbye My Love"
Ironside John Trask "Dead Man's Tale"
The Man from U.N.C.L.E. Pharos Mandor "The Master's Touch"
The High Chaparral Dan Brookes "The Kinsman"
^ a b c d Day, Carol (9 February 1998). "Stranger in Paradise". People. 49 (5). ^ a b c d e "About Jack Lord, Actor and Artist". The Richmond Hill Historical Society. Retrieved 22 May 2010. ^ a b "Book 'em Danno-Jack Lord Dies". Star-News. 23 January 1998. ^ a b Mifflin, Lawrie (23 January 1998). "Jack Lord, 77, Helped Direct And Starred In 'Hawaii Five-O". The New York Times. ^ Peterson, B (12 January 1992). "Jack Lord Remained in Hawaii to Paint". The Buffalo News. ^ Laurent, Lawrence (1 July 1973). "Jack Lord Finds Heaven in Hawaii". The Toledo Blade. ^ Rawlins, Michael R (2003). The Last American Sailors: A Wild Ride in the Modern Merchant Marine. IUniverse. p. 47. ISBN 978-0-595-30117-1. ^ a b c Laurent, Lawrence (16 January 1972). "No Resting, Coasting for Lord". Sarasota Herald-Tribune. ^ a b Vallance, Tom (23 January 1998). "Obituary: Jack Lord". The Independent-UK. ^ Brode, Douglas; Parker, Fess (2009). Shooting Stars of the Small Screen: Encyclopedia of TV Western Actors, 1946–present. University of Texas Press. p. 204. ISBN 978-0-292-71849-4. ^ "The Traveling Lady". Internet Broadway Database. Retrieved 23 May 2010. ^ Krampner, Jon (2006). Female Brando: The Legend of Kim Stanley. Back Stage Books. p. 87. ISBN 978-0-8230-8847-8. ^ "Theatre World Awards". Theatre World Awards. Retrieved 23 May 2010. ^ "Cat on a Hot Tin Roof". Internet Broadway Database. Retrieved 23 May 2010. ^ "Jack Lord Obit". Theatre World: 252. 1997–1998. ^ "Williamsburg: the Story of a Patriot". History.org. Retrieved 22 May 2010. ^ Jarlett, Franklin (1977). Robert Ryan: A Biography and Critical Filmography. McFarland & Company. p. 233. ISBN 978-0-7864-0476-6. ^ The Staff and Friends of Scarecrow (2004). The Scarecrow Video Movie Guide. Sasquatch Books. p. 569. ISBN 978-1-57061-415-6. ^ Jackson, Ronald (2008). 50 Years Of The Television Western. AuthorHouse. p. 290. ISBN 978-1-4343-5925-4. ^ Allen, Michael (1998). Rodeo Cowboys In The North American Imagination. University of Nevada Press. p. 47. ISBN 978-0-87417-315-4. ^ Tucker, Kenneth (2000). Eliot Ness and the Untouchables: The Historical Reality and the Film and Television Depictions. McFarland & Company. p. 49. ISBN 978-0-7864-0772-9. ^ Lisanti, Tom (2010). Fantasy Femmes of Sixties Cinema: Interviews With 20 Actresses from Biker, Beach, and Elvis Movies. McFarland & Company. p. 274. ISBN 978-0-7864-6101-1. ^ Shatner, William; Fisher, David (2009). Up Till Now: The Autobiography. St. Martin's Griffin. p. 119. ISBN 978-0-312-56163-5. ^ a b c d Taylor, Philip M; Roberts, Graham (2005). The Historian, Television, and Television History. University Of Luton Press. pp. 77–94. ISBN 978-1-86020-586-6. ^ Rhodes, Karen (1997). Booking Hawaii Five-O : An Episode Guide and Critical History of the 1968–1980 Television Detective Series. McFarland & Company. p. 31. ISBN 978-0-7864-0171-0. ^ a b Peck, Michael (July 28, 2005). "TV Guide-Our Take". TV Guide. TV Guide. ^ Hanneman, Mufi (October 15, 2014). "The Jack Lord Only His Secretary Knew". Midweek. Honolulu Star Advertiser. ^ "A-Z Guide of Film Production Terms". Kinema. 2008. ^ Fernandez, Collin (December 13, 2007). "My battle with Alzheimer's". Daily Mail. ^ Donnelley, Paul (2003). Fade to Black: A Book of Movie Obituaries. Omnibus Press. pp. 434, 435. ISBN 978-0711995123. ^ Daysog, Rick (22 January 2006). "From Jack and Marie Lord, a parting gift of $40 million". Honolulu Advertiser. ^ Ryan, Tim (17 June 2004). "Busted!". Honolulu Advertiser. ^ "Jack Lord Statue". Hawaii Five-O Fan Club. Retrieved 23 May 2010. Wikimedia Commons has media related to Jack Lord.